The Fisher-Price Activity Walker offers plenty of hands-on, fine-motor-skill-building activities for baby to explore, including a bat-at roller ball, colorful beads to slide and spin, doors to flip, gears to turn…and more! 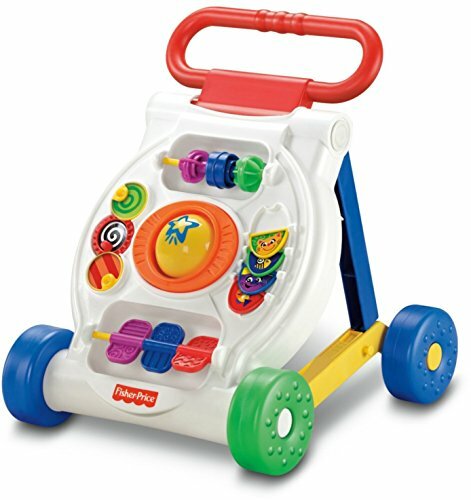 Then as baby grows, it easily converts to a sturdy walker with a large, easy-grasp handle to steady baby’s first steps. with two grow-with-me ways to play! The walker folds flat for a sitting baby, with busy activities including flipping doors, sliding beads, turning gears, and spinning panels that baby can discover!